Capturing the joy and emotion of a proud parent is one of the things we strive to do on each wedding day. The relationship between parents and their children can often be complicated, but overall there is always an immense outpouring of love in both directions; documenting the complexity of these feelings while delivering creative results is a difficult balance, but one we pull off regularly. 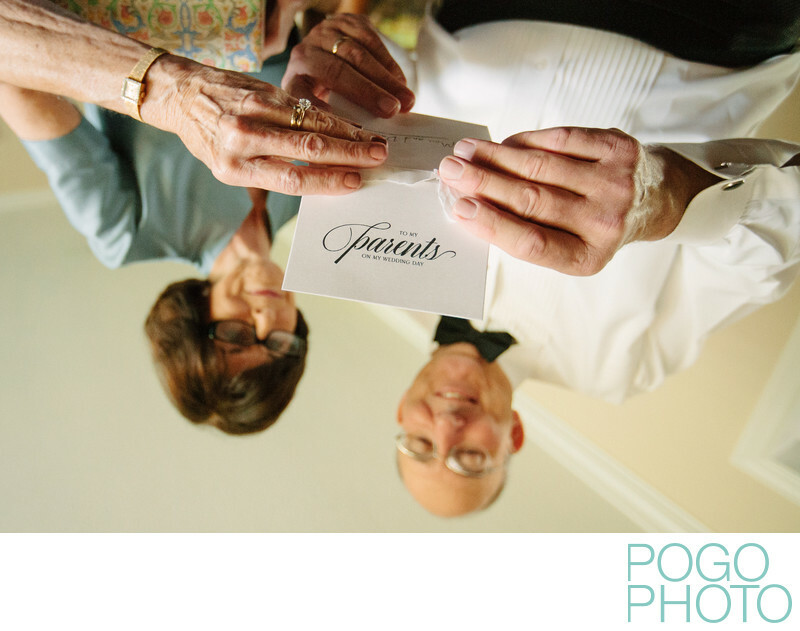 Having the trust of our clients and their families allows us to work in a manner that might not be expected, such as crouching beneath parents while they read the card their son gave them on his wedding day. Giving a card to your soon-to-be-spouse is certainly expected, but the sweet touch of a card from their son put genuine smiles of joy on his parents' faces. The added comfort of being in the family home for the groom to get ready was exceptionally helpful in increasing the relaxed feeling for everyone involved in the early preparations of the day. We find that if it's possible to get married near a family home it can simplify things immensely; even better is a backyard wedding where all of the day's events are in one place, though depending on the size of your wedding this can be difficult. Visually this image is striking because of the somewhat obvious technique of being presented "upside down", though in reality the card is now facing upright, drawing attention to the words "parents" and "on my wedding day", which is the most important detail of the image, allowing the viewer to take in the surrounding hands and faces as supplementary details rather than being the focal point of the shot. When the image is inverted the mind tends to be lazy about reading upside down script, and moves on to the next thing to look at, whereas the image as-is shows angles and intersecting lines to create dynamic interest and throw the viewer slightly off-kilter, which feels much like a wedding day does to the people involved. 1/200; f/2.8; ISO 1600; 21.0 mm.